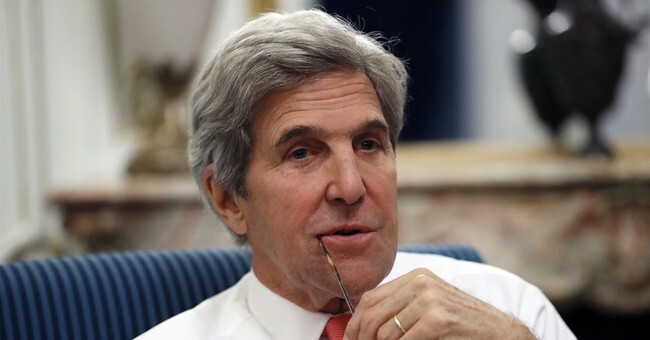 Former Secretary of State John Kerry recently made a trip to London, where he met with Palestinian official Hussein Agha. Agha is close to Palestinian Leader Mahmoud Abbas, who walked away from peace talks after the U.S. announced an embassy move from Tel Aviv to Jerusalem. During the meeting, Kerry reportedly told Agha that Abbas should essentially ignore President Trump. He also strangely suggested Trump wouldn't be in office by the end of the year. According to the report, when referring to the president, Kerry used highly derogatory terms. Kerry offered to help create an alternative peace initiative and promised to help garner international support from Europeans, Arab states and the international community. Kerry has always been a backstabber, after all, he publicly testified against and smeared fellow Vietnam soldiers. Many called the move treasonous. His meddling in the peace process, which he failed to complete during his time at the State Department under President Obama, isn't surprising. It is unhelpful, but to the left is justified because it hurts Trump, and proves he's on the side of the Palestinians. As a reminder, the Palestinians pay terrorists and their families millions of dollars to murder Israelis and Americans. Meanwhile, President Trump warned the Palestinians during Davos in Switzerland Thursday that they need to come to the table for talks or be cut out completely by the United States. "We give [Palestinians] hundreds of millions of dollars of aid and support. Tremendous numbers. Numbers nobody understands. That money is on the table and that money's not going to them unless they sit down and negotiate peace. Because I can tell you, Israel does want to make peace and they're going to have to want to make peace too or we're not going to deal with them any longer," Trump said. "They have to respect the process and they have to respect the fact that U.S. has given tremendous support to them over the years...respect has to be show to the U.S. or we're just not going any further."